The SurfaceSpectra product is a virtual treasure trove of "experience" and "knowledge" that supports surface analysis. SurfaceSpectra provides a knowledge system to support practical analysis mainly by way of the Static SIMS database and polymer XPS spectrum database. 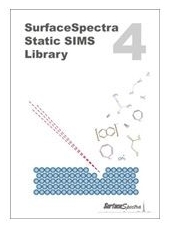 The fourth edition of "Static SIMS Library" which is the approved Static SIMS database is published in a CD-ROM version. Data Interpretation of Static SIMS and TOF-SIMS always proves difficult for analysis specialists dealing with new materials. SIMS spectral database will prove an optimal tool for data interpretation.